It was January 2018 when we first set eyes on Stella. At the time we had been searching on and off for over two years. We had just finished renovating a house in Sydney. Six months of back-breaking work, six and a half days a week. I often wondered if we would be too busted up by the end of it to sail. With the house sold, we were ready to buy. Early in our search, we had seen a few yachts that looked ok, but we were not ready, so we let them slip by. In my book, yachts are way too expensive to keep if you are not in a position to use them. Now, when we were ready to purchase, we could not find the right yacht. They were either too expensive, or Bronwyn and I could not agree. Often yachts come on the market at inflated prices. They sit around for a year or two, the seller makes one or two dramatic price reductions, and then they sell in a couple of weeks. All of the yachts we liked were at the beginning of the selling process. We started feeling disheartened, and I was deeply regretted letting some of the earlier yachts go. Then we found Stella, although she looked interesting, the photo's of the owner's cabin looked like a dog box. We just could not see how we could ever make it work. In the end, we only decided to inspect her because we had booked flights to the USA for the following week and we wanted to see an OVNI in the flesh before we left. We thought that we would see Stella and cross her off the list. We were wrong, the owner's cabin was perfect, she was perfect, it was love at first sight. We couldn't believe our luck. Launched in 2010 as Jaegaran, Stella's early history remains a mystery. We know that Jaegeran refers to a Norwegian bird of prey and that the original owner planned to sail her to Antarctica. Unfortunately, we cannot confirm whether this trip eventuated, however we do know that Jaegeran competed in the 2012 ARC rally from Gran Canaria to Saint Lucia.. In 2016 Stella was purchased in Trinidad by a Norwegian couple. From their blog, we ascertained that they had plans sail her to Antarctica. They also renamed her Stella Polaris. Stella Polaris is Latin for pole star. Scientist estimate there are approximately 1,000,000,000,000,000,000,000 stars in our universe, which is more than one thousand billion stars for every man women and child on the planet. Only 6,000 of these are visible to the naked eye, and of these, only 58 are used for celestial navigation. 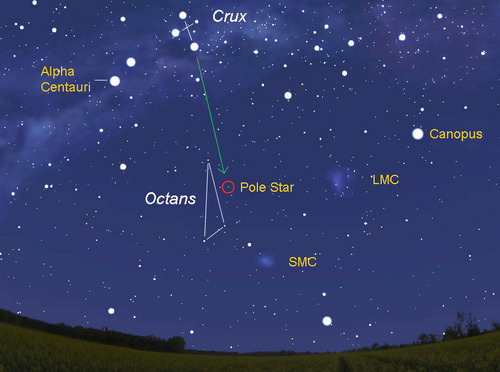 Polaris is part of this select group of stars, and if you live in the northern hemisphere, then you have probably heard of it. When we purchased Stella we loved the name and wanted to keep it. Unfortunately, in Australia, the name Stella Polaris was already taken so we had to come up with a new name.